Closerie Falaiseau was almost ready for rental when I received a phone call from an American and his wife who wanted to stay for nine days, starting just two days later. I was having dinner at L’Embarcadère with Kathy Stanford from Femmes Francophiles. Relationnel had already gone back to Paris to work. I frantically tried to remember what still had to be done to receive our first guests but it seemed “do-able”. 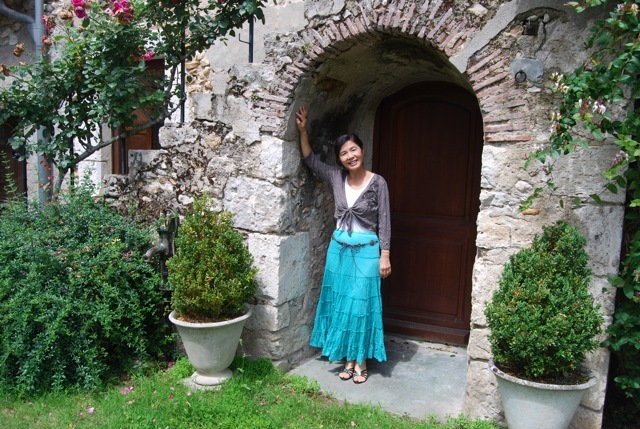 When John Modesitt and his very charming Japanese wife Toshiko arrived on the Sunday, everything was ready. I showed them around and they immediately loved the house. Toshiko seemed intrigued by the Henri II mirror in the living room and she also liked the fact that you could see the kitchen through the original oak beams. John loved all the wood everywhere. He mentioned to Kathy that he “painted” but it was not until a few days later that I discovered that he is a well-known American impressionist artist and the only living impressionist to auction in Christie’s impressionist auction. Relationnel and I returned to Blois while John and Toshiko were still there and we were delighted to see his recent paintings spread out on the floor of the kitchen to dry. They had two days left before returning to San Diego which is the time needed for an oil painting to be dry enough to roll up. John was out in the countryside finishing off his last painting. Toshiko explained to me that he had spent a lot of time working on the colour green this year. There are many different shades of green in the French landscape that are difficult to render on canvas. I had already seen some of John’s paintings on his website so I knew that I liked his style. When I saw the actual canvasses, though, I knew I wanted one! There were several I liked but one in particular took my eye. Relationnel preferred another painting but it was of Amboise and I wanted one of Blois! So we went away and thought about it. From time to time while John and Toshiko were out, we’d steal a look through the glass door of the kitchen and finally decided which one we wanted. “The Loire at Blois, Noon”. 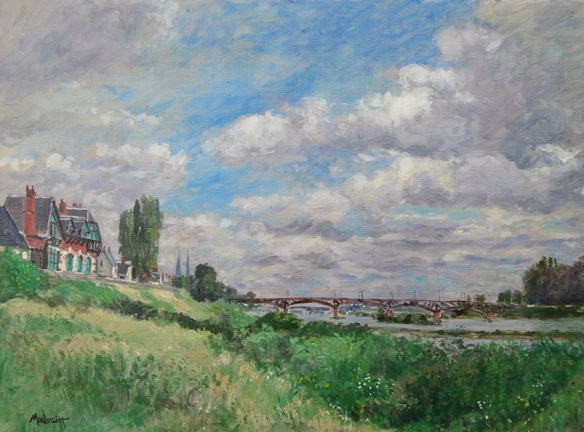 It depicts a scene that we see each time we take the lovely drive from Closerie Falaiseau into Blois along the Loire River. John just had the time to stretch the canvas for us before he left. Now all we have to do is frame it. We are extremely happy to have this beautiful work of art for more reasons than one. First, we both love the painting itself and that is surely the best criterion! We love the composition, with its brightly-coloured turn-of-the-century house and tall poplars up on the left , the steel truss bridge spanning the Loire, Relationnel’s favourite river, with its sand banks in the middle and overgrown vegetation. And you can almost see the clouds moving across the top of the canvas. Second, it was painted by someone we have met and like. Third, the artist told us it is a “special” painting for him. Fourth, it was painted by our very first guest. And last, but not least, it is a symbol of our future life in the Loire Valley where we will be living permanently when Relationnel retires in October 2014. This entry was posted in Accommodation, Art, Loire Valley and tagged Blois, Closerie Falaiseau, impressionist painting, John Modesitt, Loire Valley. Bookmark the permalink. The roses are lovely, aren’t they? I am always going to make sure I’m in Blois in June – this was the tail end! Fantastic story! And since you nicknamed me Leonardo I like it even more! John and Toshiko were such lovely friendly people. The painting is absolutely stunning! We were so fortunate to see it at the breakfast at your place the other morning. I know you will both enjoy it so much. Very nice turn of events. What a fabulous painting. John is a very talented artist. I absolutely love the painting too – can see why you fell in love with it. I look forward to seeing it framed. Will you hang it in Paris ? 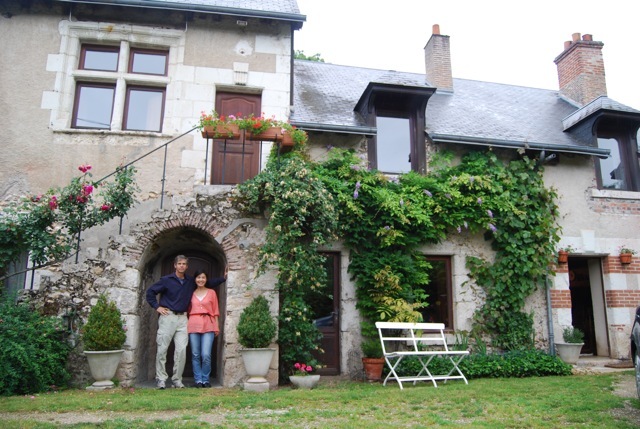 Then you will have the Loire with you there also! Yes, we intend to hang it in Paris until we go to live in Blois. As I already told you at the bloggers’ breakfast, I LOVE John’s painting! While I agree that it must be difficult to render all of the different shades of green on a canvas, I also admire how he has captured the essence of the French sky. Thanks for including the link to John’s website. I perfectly agree! John has kindly agreed to do an interview with me to post on MyFrenchLife. What a lovely story; lucky you! I love the painting and can quite see why you *had* to have it. We’ve since had it framed in Blois but are waiting until we live there permanently to take it to the Closerie.